Contrary to popular beliefs, rattlesnakes or pit vipers do not deliberately attack humans nor do they follow hikers and campers in the wilderness. Rattlesnakes, as much as possible, avoid humans and any big animals. They mainly eat mice, birds, frogs, and other insects. Since rattlesnakes are fragile creatures with only their speed and mouth to protect them from predators, they release poisonous venoms as a means of protection. When you see them take a defensive stance, that’s because snakes, in general, as vulnerable creatures. Know whether the snake is a rattlesnake or not. If you plan to go hiking or go in the wild, knowing what a rattlesnake looks like is extremely important. 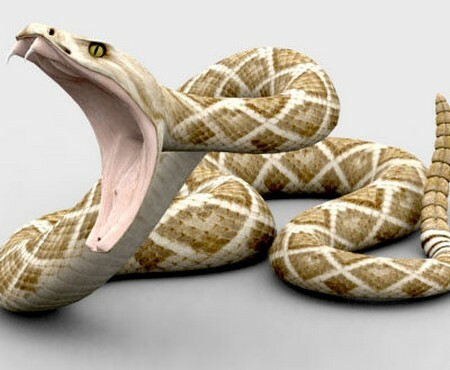 If you have no idea what it looks like, a quick search on the Internet reveals the photos of rattlesnakes in all sizes. If you come across a snake but don’t know whether it is a rattlesnake, don’t edge closer to it and stay away slowly and carefully. Know where you’ll most likely come across a rattlesnake. Although rattlesnakes are everywhere, you can frequently see them in the bushes, trees, and under huge solitary rocks. Rattlesnakes prefer to stay in warm to hot climates like the desert so if you’re planning a trip to Asia or Middle East, expect to chance upon them. Rattlesnakes are also most active during summer, especially at night, when no one could see them travel through the bushes. Always bring a flashlight with your if you feel that the place you’re in is prone to rattlesnakes. Wear clothes that protect your hands, ankles, and feet. These body parts are the most common targets of rattlesnakes bites. If you think you might come across a rattlesnake on your way, don’t don shorts, wear slippers, or expose your hands where you shouldn’t be. Always walk with someone. Don’t go into the forest and other isolated parts of national parks without a buddy. If a rattlesnake bites you and you are alone, you might be in big trouble. If you think you can protect yourself alone, make sure you have a fully-charged cellphone that you can use to call friends and loved ones in case of an emergency. Note, however, that if you trek the national parks in the U.S., there is no cellphone coverage most of the time. Stick to well-used trails. Do not veer from hiking trails and be aware of your surroundings. Don’t feel adventurous and decide to go through the less-traveled route. Rattlesnakes usually stay away from hiking trails as these expose them to people. Don’t unearth big rocks or you might be in for a bad surprise. Rattlesnakes often hibernate under rocks that can keep them in the dark. Be vigilant. When camping, survey the campsite before you set-up your tent. Listen to some “hissing” sound on warm nights because that’s when rattlesnakes like to dangle through branches of the trees. Do not ignore the warning signs. Most national parks have rattlesnakes warning signs. Do not take them lightly and take note of instructions, especially who or where to go in case you experience a rattlesnake attack. Remain a rattlesnake has bitten you, remain calm. If you panic, the rattlesnake might stike again. You will also prevent the venom from traveling fast through your veins if you stay calm. Call a friend or a family member and ask them to take you to the nearest hospital as soon as possible.